Great news! Thanks to reader Justin, it looks like TubeBox Pro has be re-released under a new name: Instatube. Go download it while it’s free and available! This post seems to be getting a lot of hits, so I thought I’d better update it. It looks like Apple has pulled TubeBox from the AppStore. Fortunately for those who downloaded it, they will still be able to use it fully with all its features listed below. If you missed it, there seems to be a influx of these types of apps appearing. *Update! December 4, 2012. Google has finally released an iPad version of the YouTube app. You are now able to search for it in the App store. However, despite this, the ability of saving videos and playing them offline makes TubeBox Pro still superior. iPad owners will notice that there currently is no official YouTube app installed on their devices. TubeBox Pro is a great third-party YouTube app for iPhone, iPad and iPod touch. TubeBox presents a great new way to watch (and save) YouTube videos on your devices. It is currently costs $1.99USD (a cheaper, $.99 version is available as well, with ads). I currently have 10 promo codes of TubeBox Pro for you. Instructions on how to win them are at the bottom of this post. A few months ago, I told you about Downloader Elite (now called Media Downloader). A great feature of that app was the ability to download YouTube videos and save them to Camera Roll. Since then, however, its developers have updated the app to remove that ability. Those of you who were able to download it before the update (and have not updated since) still can save any YouTube video. When Apple released iOS 6, they removed the native YouTube app off the devices of everyone who upgraded, due to the end of licensing agreements between Apple and Google. YouTube did release an iPhone app, which still works quite well. As of the time of this writing, for some reason, an official YouTube iPad app has not been released. You can use the iPhone app on your iPad, and while the videos look fine, the menus and playlists definitely look grainy while scaled to fit the iPad screen. I have found myself using TubeBox everyday, both at work and at home. 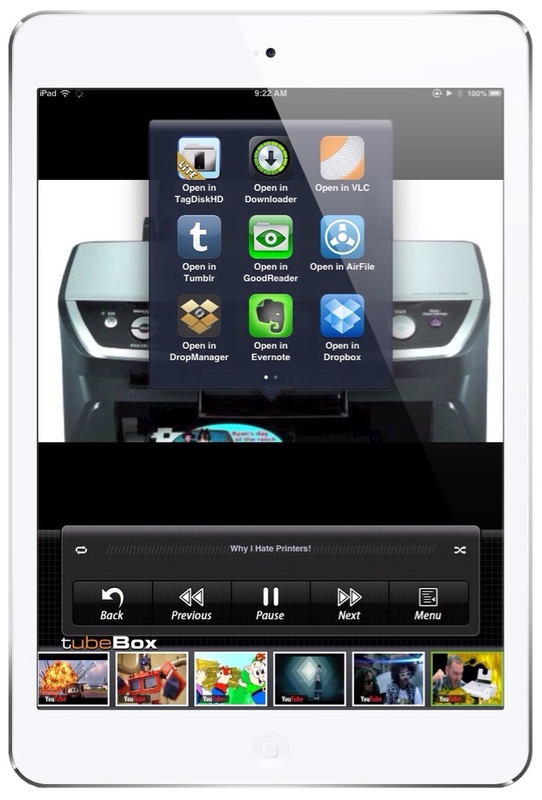 Within TubeBox, you have the capability to save any videos directly to your device for offline viewing. This, again, is a great feature, especially for those of us who like to view the same videos over and over without using any bandwidth (wifi or data). For commuters, watching your favorite YouTube videos would even work on non-data devices, like the iPod touch and wifi iPad. The home screen shows you all the “Playlists” that you can create and name. The default folders are “Featured, Favorites, and My Videos”. These are fully editable to be named anything you’d like. You can have as little or as many playlists you want. As teachers, you can divide your saved videos to subject or grade, just like within YouTube. Another great thing about having your videos saved to your Camera Roll is that you can import them into movie making apps such as iMovie or Pinnacle. The opportunities seem endless, as you can create your own movies and incorporate little scenes from almost anything imaginable. All of your YouTube playlists are available. So if you do not have a need to save any videos locally, you can just surf YouTube as you normally would on your computer. A common task I like to do during my free time is view “New Subscription Videos”. This view lets me keep up with any recent updates by the people I follow on YouTube. To save a video, simply tap the + sign. The video will then be added to the downloads list, upon which you can designate which folder you want to put it in. Playlists are continuous, meaning you can just let the videos play one after another, without having to press play multiple times. You can play TubeBox in the background; if you just want music played, you can use other apps at the same time. Another cool task you can accomplish with your saved is open them in other apps (see the screenshot below). Essentially, you can now save these videos in services such as Goodreader, Dropbox and Evernote. I tested this out: I saved a 3 minute video onto a Dropbox folder and watched it on another device. Worked great! A small request for this app would be the ability to share links to videos via email, Twitter, or Message, like you can in the YouTube app. Often, when I teach guitar, we look for videos of songs to play with and I send video links to the students so that they can practice at home. Hopefully this will come in a future release. TubeBox (iTunes link) is a must-have for YouTube users. The abilities to save your favorite videos to your Camera Roll and then edit them in iMovie make it a superb app. I think this is without a doubt the best YouTube client available. There are a lot of other paid YouTube players, but there is absolutely no need to try them out with the availability of TubeBox. This will close on Tuesday, December 4th. I will choose 10 people and let them know through Twitter Direct Message. If you don’t have a Twitter account, leave your email address in the comments. Good luck! My 6 year old daughter has down syndrome and we watch all sorts of ABC videos together as well as Barney, Gigglebellies and elmo, etc. This app would be great for us for more organization. I would set up a playlist of slideshows with instrumental backgrounds to be used as background music while student fork on self-guided projects. I’d create the playlist just long enough to fill the class. My kids love to watch Lego animations, but I would use it to bring sports training tips out to the field on my WiFi iPad. This app could possibly solve all my problems!! I’m sure it will also depend on the uploaders original upload quality as well. I downloaded tubebox a week or so ago when it was free (on both my iPhone and my iPad.) I was syncing my phone today and iTunes froze and would not complete the sync. When I tried again later in the day, suddenly my phone went into recovery mode and restored to factory settings. I was able to restore it to a previous backup, but I noticed that a good twenty or so apps that I have downloaded recently are missing. I went to the app store to redownload my apps, but tubebox is no longer in the app store… Any idea what happened to it? I’m pretty bummed because I had already made up some rather large playlists. At least it’s still on my iPad, but I’m afraid if I sync it or update to iOS 6.1 it will disappear. 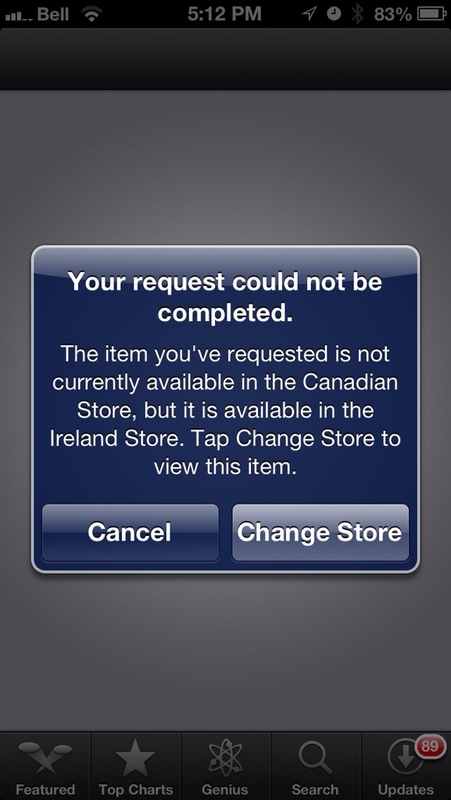 Did you try going into the “Purchased” tab on your iPhone App Store? Let me know. Tubebox should be there for a free download. You will unfortunately lose your saved video files though. Yes, it seems to be completely gone from the App Store currently, even in the purchased section. I guess it’s no longer for sale. I updated the post, as well as posted a new review for Instatube! How do I delete videos from the app? It’s probably ridiculously obvious, but I can’t seem to work it out!!! Tap on the left of the video and slide your finger to the right. The red delete button will appear.